Student Engagement: What Is It? Why Does It Matter? 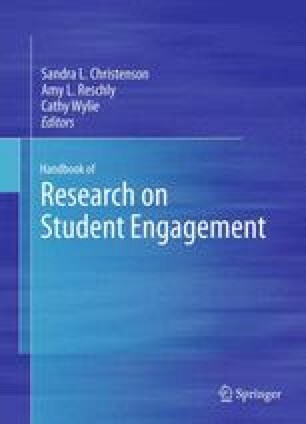 This chapter considers the relationships of student engagement with ­academic achievement, graduating from high school, and entering postsecondary schooling. Older and newer models of engagement are described and critiqued, and four common components are identified. Research on the relationship of each component with academic outcomes is reviewed. The main themes are that engagement is essential for learning, that engagement is multifaceted with behavioral and psychological components, that engagement and disengagement are developmental and occur over a period of years, and that student engagement can be modified through school policies and practices to improve the prognoses of students at risk. The chapter concludes with a 13-year longitudinal study that shows the relationships of academic achievement, behavioral and affective engagement, and dropping out of high school. The sign (+, −) indicates the direction of scoring. Items marked “−” should be reverse-scored before summing the items in the subscale. (Items 29–31 are not part of these subscales). The items in this questionnaire have been combined in different ways for use in different research studies. This questionnaire is in the public domain and may be used without permission. Notification to the author is requested. The eighth-grade version of the questionnaire is available from the author upon request. Below are items that describe children’s behavior in school. Please consider the behavior of the student named above over the last 2–3 months. Circle the number that indicates how often the child exhibits the behavior. Please answer every item. 25. raises his/her hand to answer a question or volunteer information. 31. Does this student attend special education classes outside of your classroom? Thank you for your time. Please enclose the teacher/class information sheet and all the questionnaires—those completed and not complete—in the envelope provided and return it to your principal.